Moreover, the pulse approaches a -function as . Figure 71: Diffusive evolution of a 1-d Gaussian pulse. Numerical calculation performed using , , , and . The pulse is evolved from to . 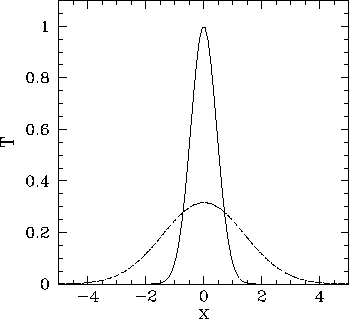 The solid curve shows the initial condition at , the dashed curve the numerical solution at , and the dotted curve (obscured by the dashed curve) the analytic solution at . Figure 71 shows a comparison between the analytic and numerical solutions for a calculation performed using , , , , and . It can be seen that the analytic and numerical solutions are in excellent agreement. 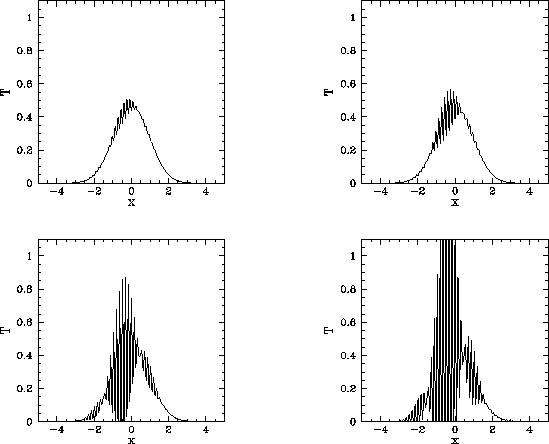 Figure 72: Diffusive evolution of a 1-d Gaussian pulse. Numerical calculation performed using , , , and . The simulation is started at . The top-left, top-right, bottom-left, and bottom-right panels show the solution at , , , and , respectively. It is reasonable to expect that as increases at fixed (i.e., the spatial resolution increases at fixed temporal resolution) the numerical solution should become more and more accurate. This is indeed the case--at least, until exceeds a critical value. Beyond this value, there is a catastrophic breakdown in the numerical solution. This breakdown is illustrated in Fig. 72. It can be seen that the solution develops rapidly growing short-wavelength oscillations. Indeed, the solution eventually becomes effectively infinite. Let us investigate this unusual and rather disturbing phenomenon.